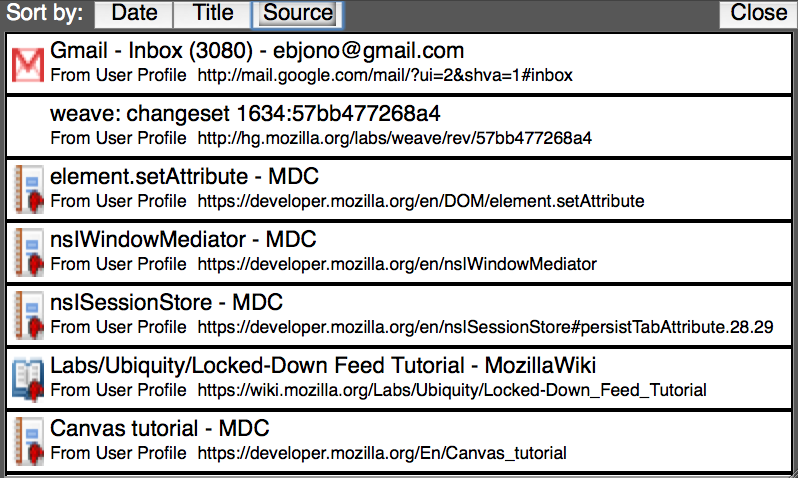 While we were working on Test Pilot studies, Patrick Dubroy was doing his own research on Firefox tab usage patterns. He presented his findings a paper at CHI 2010 last week. Now he’s put up an excellent blog post summarizing what he found out. Go read it right now! My wife strongly dislikes the new Firefox 3.6 tab behavior (where tabs opened from links appear immediately to the right of their parent tab, instead of at the extreme right of the tab bar). I do like the new behavior, because by keeping related tabs closer together, it reduces the amount of time I have to spend interacting with the tab-bar scroll buttons (my least favorite UI element in all of Firefox). She dislikes it for consistency reasons: when you open a new blank tab, it still appears at the far right. So now tabs can appear in two different places, depending on where you opened them. It violates the principle of consistency, which is generally considered one of the most important UI principles. This inconsistency hasn’t really bothered me personally. I’m not sure why; maybe it’s because opening a tab through a link, and opening a new blank tab, feel like different actions to me. There’s a difference in what I’m thinking about. But I can certainly understand how it feels like a consistency violation to other people. We’ve had over 5,000 users submit data from the Test Pilot tabs study! Considering that people had to first hear about Test Pilot, then opt in by installing the extension, then opt in again by choosing to submit the data, 5,000 is a really good number. Better than we had any right to expect, certainly. 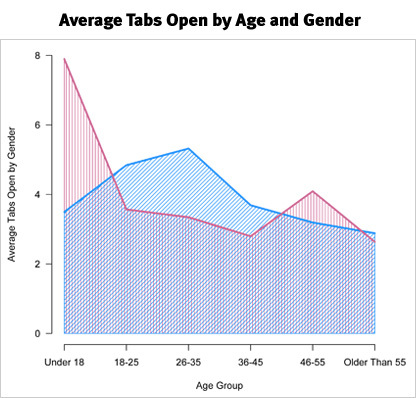 Over the past couple weeks, I’ve been sifting and analyzing the data, and working with Blake Cutler from the Mozilla Metrics team to generate graphs of interesting statistics about tab usage. I’ve just put up a results page showcasing several of these graphs. We’ve also posted samples of the aggregated data which are free for anyone to download and use. There was some discussion on my previous post about how to aggregate the data in a way that was still useful to researchers. What we ended up doing was building files that include row-level data from a random subsample of the users that fit particular criteria. It’s stripped of any information on the language/locale, operating system, or installed extensions for any individual user in the sample. Third-party researchers have already begun using the data to do their own analysis! Andy at Surfmind.com has a post containing some very cool-looking visualizations and has proposed an interesting theory about there being two classes of heavy tab users. I get a lot of people contacting me by email, IRC, forums, or blog comments to say that they’re “worried that if I join Test Pilot I’ll skew the data” because “I’m sure that my tab usage is atypical”. People! Don’t worry about being an atypical user! First of all, we have already had almost 5,000 Test Pilot data submissions. One outlier isn’t going to do much to “skew” a data set of that size. But more importantly, you shouldn’t assume that you’re abnormal. We don’t know what “normal” tab usage is! That’s why we’re doing this experiment, to find that out. If we started out with an idea of what normal tab usage looked like, and threw out things that didn’t match our preconceived notions, that would be a clear case of experimenter bias. Then we’d really be skewing the data. For instance, I was surprised to find out that there are users who have over 500 tabs open at a time. Over 500! They’re surely outliers, but they’re not abnormal users &emdash; they’re just users. That number isn’t skewing the data &emdash; it is the data. Thanks to those users’ participation, we now know that having 500 tabs open is something that people do with Firefox, something we might not have known otherwise. As I said in a previous post, I do believe we have a major oversampling of the power-user / early-adopter demographic in our current Test Pilot user base, and that we need to work on fixing this by reaching out to a wider sample of users. But note that word: wider. Excluding yourself because you think you’re atypical isn’t helpful. If you really want to help our sample — and I’m touched that so many of you do want to help " the best thing you can do is to let your less-techie friends know about Test Pilot.